What do you mean how do I see? Help! I've gone blind! 1) Under the standard rules and creature descriptions, Undead are immune to “mind-affecting” spells – but not all illusions are “mind-affecting”. Therefore this is no reason to conclude that standard undead are immune to physical illusions. 2) That the basic assumption in the standard d20 rules is that – unless a creature is explicitly given some special ability or disability – it’s abilities are comparable to those of a human or it’s closest real-world equivalent. Therefore undead do not have some special “lifesense” unless such a thing is specifically noted and “the simplest answer is that their senses work like human senses”. The first conclusion is fine, but the second manages to be correct in essence while being blatantly wrong in detail. It’s obvious enough that if a creature does not have a human-style eye and neural net, it cannot see in the way that a human does. It ignores that fact that human senses vary a lot in acuity between individuals. It ignores color-blindness and other human variations. For that matter, nothing in the game rules actually addresses creatures that we know have similar but somewhat different senses – such as bees that see into the ultraviolet, snakes that pick up thermal radiation for night hunting, dogs that hear higher-pitched sounds than a human can make out, or even the simple loss of sensory acuity with age. Animals all get low-light vision, despite the fact that many real-world animals have no such adaption. In fact, in the third edition (in a sloppy holdover from earlier editions, where “wisdom” meant something quite different from it’s current odd combination of will and perception) wisdom increases with age – meaning that getting old makes your senses better. The “correct in essence” part comes from the fact that those differences are almost always insignificant in terms of the game – which glosses over a lot of details to make playing it easier. A skeleton may be perceiving the world through some bizarre magical process, but whatever methods it’s using, the default game assumption is that the net result is close enough to human senses to let the game master run the game easily. That’s why the brief sections on vision, light, darkness and blindness (including the commonly overlooked note that if you can’t see properly, you can’t use sneak attack damage), blindsight, blindsense, darksight, low-light vision, and tremorsense mostly focus on combat modifiers. There’s a note that tracking by scent requires a check (wisdom or possibly survival, depending on where you look – but there’s no rule allowing a “Scent” skill for creatures with the Scent ability) – but it looks like that’s mostly in case someone has a bloodhound Familiar or something. There’s also a note that concealment isn’t always effective against special senses – but there isn’t much of anything more. For the most part though this is indeed quite good enough. Mr Reynolds then goes to state that giving the Undead some special “life sense” would be a huge advantage – and that taking away their normal senses would make it impossible for them to function, since they’d have no way to perceive anything that wasn’t alive. The basic arguments here boil down to “none of the books say that “, “it would change their challenge ratings”, and “it’s too complicated”. Nothing in the books is “proof” of anything except what’s in the books – and the setting always takes priority since – ultimately – a game master can always keep the setting and drop d20. There are lots of generic rules sets out there. Now it IS incumbent on the game master to think through the consequences of anything he or she changes, so as to keep their setting consistent. Vampires have normal senses in addition to lifesense because their bodies are posed between life and death, and still work to some extent. Liches and (and presumably some other high-magic undead) still effectively have normal senses because they have the raw magical power needed to fake them. Those undead who are relying on Lifesense won’t have any trouble perceiving the world enough to function – but they’re going to see it through layers of fog. Every solid surface is dusted with bacteria and molds and the air itself is full of spores and germs. Inside a stone wall will be an area with little to no life, it’s surface will be crawling with it, and the air will be dimly “lit” by it. Constructs will be a lot like walls – perhaps a bit hard to make out, but easily tracked once spotted. Ergo, to prevent an overwhelming flood of data, lifesense will either need a limited radius of effect or to be line-of-sight. Either has it’s consequences. If lifesense has a limited radius – essentially acting as a limited form of Blindsight or Blindsense – undead will be difficult to creep up on or flank, and hard to hide from, but any idiot could just stand outside their sensory range to work on attacks and they’d never know it until the attacks started and could be traced back. This sounds like a good “lifesense” option for Vampires and Liches, who also have normal senses to use. Honestly, it seems like it really should be kind of hard to slip up on creatures like that. They get a kind of Blindsense. If lifesense is line-of-sight, then it works a lot more like normal sight – and incorporeal undead can’t use it to navigate through solid matter. Masses of life will swamp it at range, and stealth will work just fine. Staying out of line of sight, or creeping along under the cover of a cloak (which is dusted with bacteria, but isn’t nearly as alive as the wearer) will work just as well against this version of lifesense as it will against normal sight. In either case, “lifesense” isn’t affected by darkness and will indeed penetrate virtually all conventional illusions – but it won’t allow anyone relying on it to read, or let them know that they’re glowing with Faerie Fire, or spot a newly-created (and thus relatively uncontaminated) wall – although a wall of fire might show up as a suddenly dead spot. Similarly, they won’t realize that they’re walking into a just-cast Web spell. Undead using lifesense can be flash-blinded if they’re too close to someone using a curative spell and can be fooled by illusions directed against their lifesense. Perhaps scattering a cloud of gnats – effective invisible to normal people – will act like a cloud of concealing fog against undead who are relying on lifesense. To be fair, most living creatures will probably be able to sense the unnatural presence of the undead too – although they, having many other senses, will probably not have such a sense very well developed; ergo, they’ll be using a simple, few-details-provided radius version – a version of “blindsense” that only reveals the presence of undead. Still, that covers the classic “unnatural chills”, “having a bad feeling about this place”, and “sensing evil presences” very nicely. Now, this is indeed considerably more complicated than defaulting to humanlike sensory abilities – but it opens up a lot of interesting possibilities. There will be special strategies and weapons for use against the undead. 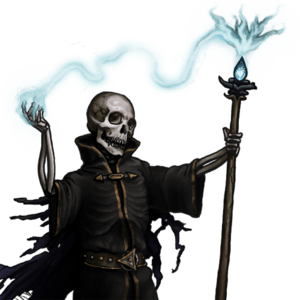 Illusion-casters might be able to undergo some exotic initiation – perhaps spending some time “seeing” as the undead do while learning to cast illusions against lifesense – to make their illusion spells effective against the undead. Perhaps Monks can learn to “mute their chi’ and so slip past undead more easily. Yes, as Mr Reynolds notes, it’s “easier and simpler” to just assume human senses – but it’s even easier, and far, FAR, simpler, to just go and watch TV instead of playing with the d20 system at all. If we were looking for “easier and simpler”, we wouldn’t be fiddling around with role-playing games. I think this post, with it’s “interesting possibilities” proves the point that I made in my comments to the original rant! However, I have a problem with the second paragraph. Perception, in 3.x, is divided into two sense, Spot and Search, and both are INT based, not WIS based. Rather than “Perception” getting better with age, and therefore the senses getting better with age, it would be more accurate to say that “Perceptiveness” gets better with age. Your eyesight might be failing, but experience permits a better, more effective, interpretation of what is percieved. Sorry, but no: Search is indeed intelligence based – but it’s not a direct perception skill. Spot and Listen are both wisdom-based skills in both the 3.0 and 3.5 System Reference Documents. Unskilled perception checks for other senses are also Wisdom checks in the one place they’re mentioned (under Scent). As for the elderly… I take it you’ve never worked with many of them? Failing sight, failing hearing, and – for that matter – failing memory. Yet, in d20 aging, both Wisdom and Intelligence – enhancing all sensory and intellectual checks – increase with age. Fortunately, that kind of thing comes up rarely enough in most games that it really doesn’t matter much.